The Chicago Skyway School Support Program continues this fall, sending students in Chicago's 7th, 8th and 10th wards back to school with new backpacks, donated by Skyway Concession Company. 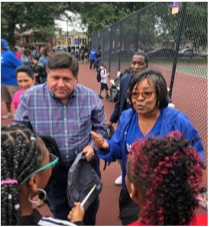 8th Ward Alderwoman Michelle Harris is joined by State Rep. Marcus Evans and Democratic Gubernatorial Candidate J.B. Pritzker to distribute book bags donated by the Chicago Skyway. Skyway Concession Company (SCC), operator of the Chicago Skyway Toll Bridge (Chicago Skyway), welcomed neighborhood students in wards 7, 8, and 10, back to school with a donation of more than 1,200 backpacks. 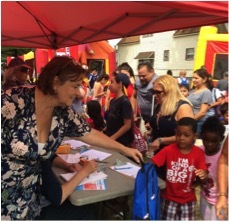 SCC partnered with Alderwomen Susan Sadlowski Garza of the 10th ward and Alderwoman Michelle Harris of the 8th ward to distribute the donated backpacks during each ward’s annual “Back to School” picnic. Backpacks were donated directly to nominated schools in Alderman Gregory Mitchell’s 7th ward. “These events and donations speak to the Chicago Skyway’s continued commitment to local communities, with a focus on education through the support of students, parents, teachers, and neighborhood public schools. The donation of backpacks helps give students the supplies they need to succeed,” said CEO Fernando Redondo. Later this year, SCC will continue its tradition of awarding nominated public schools in the 7th, 8th, 10th and 20th wards with monetary grants to support the unique needs of students and schools in the wards traversed by the Chicago Skyway. About the Chicago Skyway: Built by the City of Chicago in 1958, the Chicago Skyway Toll Bridge is a 7.8-mile-long toll road that connects the Indiana Toll Road to the Dan Ryan Expressway on Chicago's South Side. The main feature of the Skyway is a 1⁄2-mile-long steel truss bridge, known as the "High Bridge." The bridge itself spans the Calumet River and Calumet Harbor, a major harbor for industrial ships – its main span extends 650 feet long and provides for 125 feet of vertical clearance. The City of Chicago maintained and operated the Chicago Skyway until January 2005 when Skyway Concession Company assumed those responsibilities pursuant to a 99-year lease. The lease agreement between Skyway and the City of Chicago was the first privatization of an existing toll road in the United States.